You are driving down the interstate, looking for the nearest outlet of your favorite fast-food restaurant. The billboards tell you things you didn't ask to know, until finally one says there's an app that will find what you're looking for. You pull over, download it on the spot, and two exits later sit down to that perfect meal. 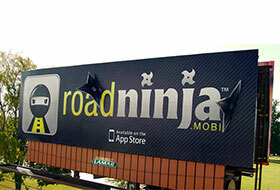 This app, called RoadNinja, was launched late last week by the Lamar Advertising Co. You can check it out on iTunes. Its arrival suggests that CMOs still figuring their 2012 new-media budgets better include some for outdoor media. Think about it. We talk so much about how to make online technology relevant locally and in real-time (witness Walmart's announcement last week that it will use Facebook to send local promos to its millions of "friends"). But we're surrounded by media tools that already do both, from billboards and newspaper ads, to radio and TV. They've just been used, owing to the limitations of technology, to target mass segments of the population, based on highly imperfect data. There's nothing inherently wrong with "old" media other than that we choose to put garbage into it. Consumers didn't start waking up hating print ads, per se, but rather learned to hate stupid ads, or hate the fact that marketers presumed it was OK to interrupt them with info they didn't care about. In response, we dug ourselves ever-deeper holes –- and still do –- by creating entertaining content to win their tolerance in exchange for not asking them to buy anything. Lamar is taking a different approach. It is infusing its billboards with immediate utility, which makes them newly relevant. Not to mention creating a new new-media channel on the app, through which it can also deliver ads. That gas station at the upcoming exit can run a promo that the driver will see as he is finding the address of the restaurant he needs. This isn't branding by engagement or conversation or osmosis. It's not entertainment, just a smart rethink of the good ol' purposes of marketing. It sells stuff. But unlike the old-fashioned marketing that could only give the consumer information that he might decide to use some day, Lamar combines new and old media to get the viewer to act immediately to fulfill a need he has in the moment. Skip the "more info" URLs. I'm blown away by how many products and services still list a web site, as if anybody cared. Lamar's billboards use the available real estate to give consumers an immediately relevant and useful call to action. Your ads and products labels should do so, too. Things like apps and the mobile experience of web content mean that everyone's a direct marketer now. Think next media, not new media. The billboards smartly recognize that what matters is what happens next, not just now. So think less about the glorious immersion of your digital media creations and more about how every media placement links to another one. Every radio spot should have a phone number (or SMS address, better yet) with content directed to motivate dialing. Every magazine ad should reference another one, or a TV spot, or whatever. You get the idea. Consumption is the ultimate metric. Don Schultz, the godfather of integrated marketing communications, says that what matters is how consumers actually experience a variety of media, often simultaneously, rather than the clicks or eyeballs registered by any of the constituent parts. Recognizing this consumption synergy is reality, not an option, and Lamar uses it to accomplish a strategic goal. Your metrics should measure not just engagement, but what the combination of media consumed produces. The RoadNinja campaign's initial run will be from Oct. 11 through the end of the year, utilizing over 1,000 billboards across 200 markets nationwide. You can tell I'm excited about what Lamar's doing. I think you should be, too. The original article appeared on Ad Age's website. Baton Rouge-based Lamar Advertising Company will begin handling all advertisements placed on SamTSarans public transit and transportation programs in the San Mateo County area.